The mission of Blue Moon Hemp is to educate the public on the variety of nutritional and health benefits that are associated with CBD-rich hemp oil. Their goal is to help the market understand that, when it comes to their High-Grade CBD Rich Hemp Oil, less is often more, which will help consumers to save money. It’s clear that Blue Moon Hemp has very good intentions when it comes to their customers. The main priority of the brand is to combine top-quality CBD oil and affordability, and the reason they are able to do this – as stated on the website – is because of their “strong buying power.” This is a perk that they happily pass down to consumers. Blue Moon Hemp is 100% dedicated to making it as easy as possible for consumers to use their natural, plant-derived and hemp-based products. If you are looking for affordable, high-quality hemp products, then this Blue Moon Hemp review is for you as you’ll see that the firm is certainly worth checking out. Read on to find out more about this fascinating operation. Who is Blue Moon Hemp? 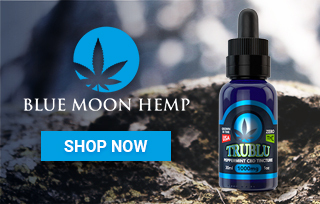 Blue Moon Hemp has created the highest grade CBD oil at an affordable price that will allow consumers to use it as a daily “wellness” supplement. Having been founded in 2015, Blue Moon Hemp is a veteran in the world of CBD. They have already sold one million bottles of their CBD oil made from a single genetic hemp strain, grown by a Kentucky farmer who uses sustainable farming techniques. Blue Moon Hemp takes pride in carefully sourcing their hemp, and all of their products incorporate very potent CBD that is rich in nutrients. In addition to using high-quality, potent CBD, the company also only uses the best ingredients out there to make their products. They won’t ever use questionable chemicals or cheap filler ingredients. Their collection is both enormous and varied, as the line consists of a wide range of products that can be administered in different ways. But most impressive is how passionate the company is in regards to educating the public about CBD and how people could benefit from using it. Not only do they run a blog and manage a forum on these topics, but they also display multiple links to different studies. This kind of education is very important and very much needed since there are still people out there suffering from chronic illnesses but have never heard about CBD, nevermind why it could be helpful. By spreading the word on such a large scale, they are bound to help more than just a few people who are in need. Free shipping on orders over $99: US-based customers can get free shipping when they spend more than $99. If you are a regular customer, then free shipping can save you a lot of money in the long-run. Public education: We love how committed Blue Moon Hemp is to educating the public on CBD and its multiple health benefits. This does a great deal in changing the perception that society has on cannabis and its compounds. Environment-conscious: Blue Moon Hemp only use organically grown , non-GMO hemp from farmers that make use of eco-friendly and sustainable agricultural methods. Certificate of Analysis: On the Blue Moon Hemp website, you can find a published Certificate of Analysis that is available for viewing. 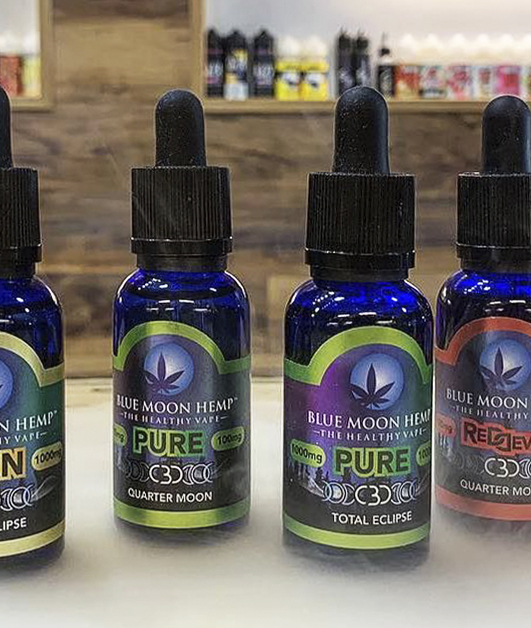 Blog: Blue Moon Hemp has a ‘Press’ section on their website where they share various articles on everything ranging from CBD oil, vape juice, and CBD concentrates to CBD gummies, vape pens, and more. While we love most things about Blue Moon Hemp, there is an area that we are not too impressed by. That is their website. There is very little information out there as to who exactly Blue Moon Hemp are, who started the company, the story behind the brand, who runs things. These are all things that many CBD brands do address, but there is no such information from Blue Moon Hemp. Even under the “About Us” section on the website, they only talk about their mission and their products. There’s no background story. This is certainly information that we would like to see added. We feel that it adds an element of trust and helps consumers to feel more connected to the brand. E-liquid: The vape e-liquids are available in a variety of different flavors and strengths. The flavors include Pure, Black Kat, Red Devil, Flan, and Kush and strengths range from 100 mg to 1000 mg. Black Kat is their classic breakfast cereal flavor, Pure lives up to its name and has a pure taste, Red Devil is a blend of Strawberry and Vanilla, and Flan is the Crème brûlée of vape juice. Tinctures: The tinctures are available in pure, peppermint, and berry flavor and in strengths of 100 mg, 250 mg, 500 mg, 1000mg, 2000mg, and 3000 mg. Blue Moon Hemp use Nano-Technology and high-speed emulsion methods to create a micro-encapsulation of the molecules which result in greater bioavailability. Pet Tinctures: There are two different flavored pet tinctures for sale; Bacon and Tuna. Each is available in a strength of 250 mg.
Salves: The salves are sold in three different flavors: Natural, Eucalyptus, and Limonene, and can be purchased in either 10 oz, 20 oz, or 40 oz. The salves have been created to penetrate the epidermal layer to ensure that they go directly into the muscle tissue and joints. Shatter: The shatters can be bought in either Sour Diesel, Sativa, Pineapple, or Blueberry flavors. There are two options when it comes to strength; 0.5 gram or 1 gram. E-liquid: The vape e-liquids range in price from $29 to $129. The lowest strength of 100 mg costs $29, 200 mg is $49, 300 mg is $59, 400 mg $69, and 1,000 mg is $129. Tincture: The price range for tinctures is between $19 and $259. The cost depends on what strength product you select. Pet tinctures: Both the tuna and bacon flavored CBD tinctures cost $39. Salves: The salves have a price range of $25 to $69 – the 40 oz strengths salves are the most expensive. Shatter: The 0.5 gram of shatter will cost you $39, while the 1 gram products have a going price of $69. Blue Moon Hemp is a brand that is very much committed to giving consumers the best possible products at the best possible prices. This is a trustworthy, reliable, well-researched brand which stocks a very impressive selection of products. If you’re new to the CBD world or are simply looking for a new CBD brand to try, we highly recommend giving the Blue Moon Hemp products a test. Conor from Ashburn just bough! Otto from Ashburn just bough! Adelaide from Ashburn just bough!